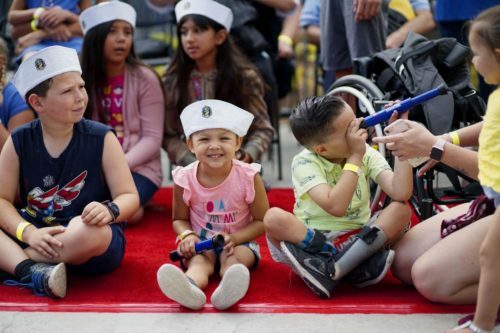 CARLSBAD–San Diego has a new fleet of submarines in town that are geared for exploration and Legoland California Resort is inviting all active U.S. military to come ride the 22,000 pound sea vessels for free in August. The submarines are a part of the family theme park’s new Lego City: Deep Sea adventure submarine ride that features real real sharks, rays and fish amid new Lego models all themed around a ship’s sunken treasure. All month long, active military personnel will have unlimited access to experience the interactive underwater sea adventure and enjoy Legoland Park, Legoland Water Park and Sea Life aquarium. Active U.S. military personnel can visit any Legoland California Resort ticket booth or guest services window, show their military ID and receive one, same day Resort Hopper ticket during the month of August. For details on active military free in August, and friends and family ticket offers, visit: www.Legoland.com/Militaryfree.